8K is now being regularly broadcast in Japan | What Hi-Fi? At 10am on Saturday (1st December), Japan broadcaster NHK began broadcasting in 8K. Content with the superior resolution, which is 16 times that of HD, is now being broadcast on two satellite channels, BS4K and BS8K, with the latter scheduled to play 8K broadcasts for around 12 hours a day. The 7680 x 4320 pictures will be broadcast with 22.2 multi-channel audio, too. With limited 8K content to hand, it shouldn’t come as a surprise that most of the schedule is made up of repeated programming, though. The first programme, at 10am, was an information broadcast revealing future shows on the channels, while the launch night film later that day was Stanley Kubrick’s 2001: A Space Odyssey. NHK said it had asked Warner Bros to scan the original 65mm film negatives in 8K for the occasion, according to the BBC. As we've known for some time, Japan broadcasters are gearing up to show the Tokyo 2020 Olympic Games and Paralympic Games in 8K in 18 months time, where a live 8K workflow will be required. A considerable spend on hardware is necessary to watch these broadcasts, however. For starters you’ll need a 8K TV (you're looking at a minimum of £5000), and then you'll need a source: as they’re being shown on satellite as opposed to terrestrial channels, a dedicated satellite dish is required. As reported by advanced-television.com, market analysts IHS Markit says that it predicts only 18,000 8K sets sold globally this year - considerably down on its own earlier forecast that the number would be 85,000 units in 2018. 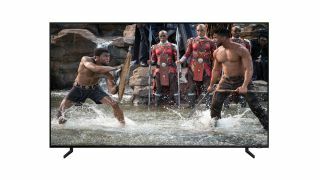 That figure will no doubt increase next year – at least in some parts of the world – with more 8K TVs, from LG for example, being announced at CES 2019 and hitting the shelves in the following months. After all, only Samsung and Sharp currently have 8K sets on the market. Still, 8K will likely be a novel, niche concept for at least a few years - as 4K was. So don't worry, your 4K TV isn't obsolete yet.